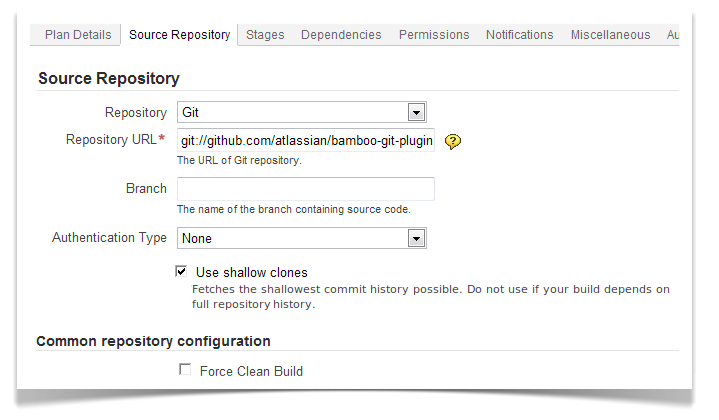 With great pleasure, Atlassian presents Bamboo 3.0 with artifact sharing, Git support and a revamped user interface. Upgrading to Bamboo 3.0 is free for all customers with active Bamboo software maintenance. You can download Bamboo from the Atlassian website. If upgrading from a previous version, please read the Bamboo 3.0 Upgrade Guide. Bamboo 3.0 allows artifacts produced from a Job to be shared with other Jobs in the same Plan, without being rebuilt every time. Build your artifacts in the first Stage and pass them through Unit and Acceptance testing Stages. When the build has completed, you will have every confidence that the final artifact has been thoroughly tested, works and is ready for further deployment. Artifact sharing for Maven 2 is also supported, but in beta. Bamboo now supports Git. If you use this distributed version control system (DVCS) or are thinking of migrating to it, you can use Bamboo to build any source code maintained in Git repositories. In our previous release, Bamboo 2.7, we introduced Stages and Jobs to improve the way your Builds are structured. The user interface wasn't ideal for representing the new Plan structure though. In this release, we've taken the opportunity to completely overhaul the Bamboo user interface, including the Plans, Jobs and Build Results screens. If you are currently using Atlassian's JIRA, you'll feel right at home with the new look and feel! A more neutral color scheme to improve readability of the screens. Redesigned controls — slicker tabs, svelte forms and tables, Atlassian-standard headings and better buttons. Layout changes — functions moved into dropdowns to make key information more prominent. As part of our drive to improve the Bamboo user experience, we've implemented better user interfaces for Plans and Jobs. The new Plan Navigator shows you the Stages and Jobs hierarchy in a Plan, as well as allowing quick navigation to Jobs. If you are looking at a Job, it will be highlighted in the Plan Navigator. Common functions have been moved into an 'Actions' menu for easy access. The interface also looks much cleaner, due to a better organized layout and the new color scheme. 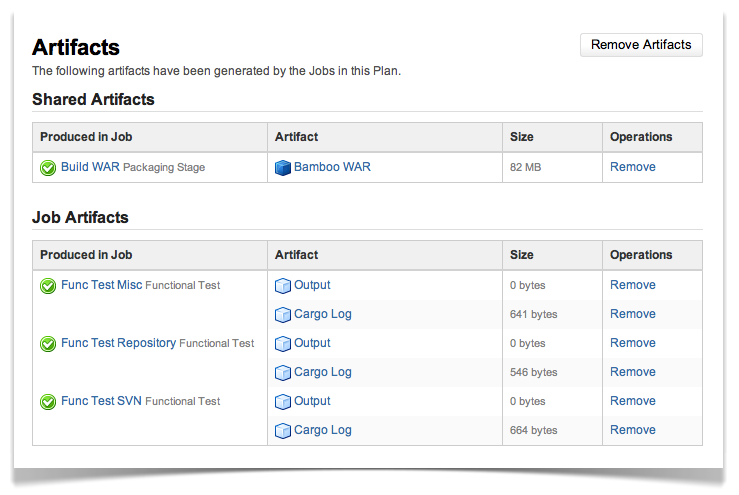 The Build Results user interface for Plans and Jobs has also been improved in Bamboo 3.0. This includes a status ribbon that allows you to see whether a build was successful or not, at a glance. We've also added a history navigator that allows you to view the status of and navigate to, prior and subsequent build results. An updated layout and the new color scheme complements these new features. Bamboo now allows you to schedule when you want to poll your source repositories for changes. You can create a schedule using Cron expressions, but don't worry if you can't remember all that Cron lingo. 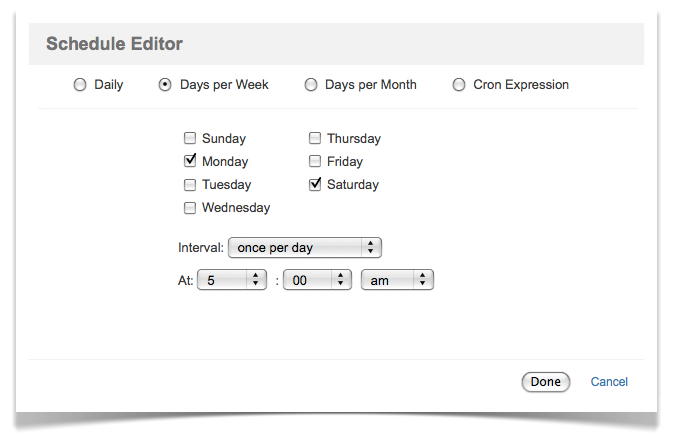 Bamboo has an easy-to-use user interface that allows you to create your schedule without any expression magic required. All configuration changes in Bamboo are now recorded in the audit logs. This allows you to track down whether a build failed because of an actual problem in your code, or whether a Plan configuration change was responsible.